Internal energy is defined as the energy associated with the random, disordered motion of molecules; it refers to the invisible microscopic energy on the atomic and molecular scale. Kinetic energy is energy of motion. The kinetic energy of an object is the energy it possesses because of its motion. Temperature measures the average kinetic energy of the particles in a substance. It measures the degree of heat (high energy or low energy) of a substance. Heat is defined as energy in transit. 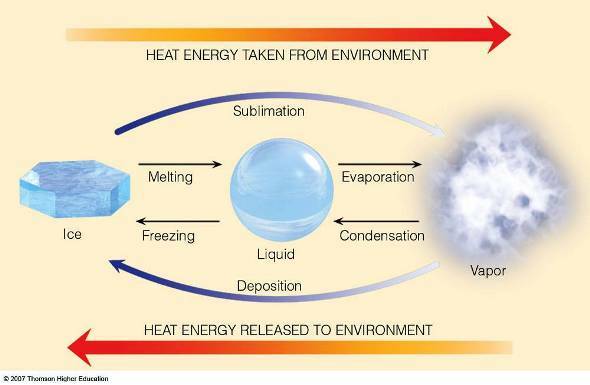 Heat (internal energy) moves from a high temperature region to a low temperature region. This is called heat transfer. Heat transfer refers to the movement of heat from one object to another. Latent heat is the energy required to change a substance from one state to another at constant temperature. When a substance changes from one state to another, latent heat is added or released in the process. 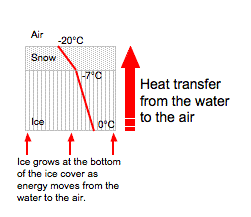 Figure 5.16: The diagram above shows how heat is transferred as water changes states. 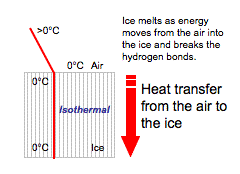 Figure 5.17: The diagrams above illustrate the latent heats of freezing and fusion. The latent heat of freezing is the energy released from the water and added to the environment, in order for water to freeze into ice. When heat is subtracted from liquid water, the individual water molecules will slow down. They eventually slow to the point at which the hydrogen bonds do not allow the liquid to rotate anymore. Ice now develops. The latent heat of fusion (melting) is the energy that is taken from the environment and added to the ice to melt it into water. This energy is used to break the ice lattice bonds and allows the ice to go from a lower energetic state to a more energetic state (water). When water undergoes a phase change (a change from solid, liquid or gas to another phase) the temperature of the water stays the same. Energy is being used to either weaken the hydrogen bonds between water molecules or energy is being taken away from the water, which tightens the hydrogen bonds. When ice melts, energy is being taken from the environment and absorbed into the ice to loosen the hydrogen bonds. The temperature of the melting ice however stays the same until all the ice is melted. All hydrogen bonds must be broken from the solid state before energy can be used to increase the water’s temperature. Figure 5.18: If heat were added at a constant rate to a mass of ice to take it through its phase changes to liquid water and then to steam, the energies required to accomplish the phase changes (the latent heat of fusion and latent heat of vaporization) would lead to plateaus in a temperature versus time graph.